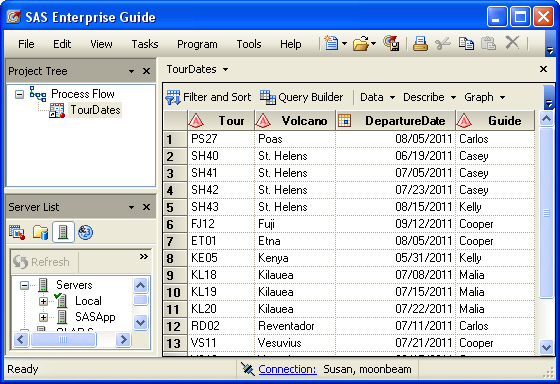 There are many reasons to use Enterprise Guide. Here I present my list of the top 10. The drum roll, please…. If you have a Base SAS license for the Windows operating system, then you don’t have to pay a cent more to use Enterprise Guide. So you might as well try it, right? With just a little bit of practice, you can master EG and add another item to your resume. Well, sort of. EG is already a tool for learning SAS programming, but there is room for improvement. To fulfill its potential EG needs two things. First, it needs to hide those ugly housekeeping statements that get tacked to the beginning and end of every SAS program when EG passes it to your SAS server. EG doesn’t need to get rid of them, just give us an option to hide them–and make hiding them the default. EG 4.2 has taken a step in the right direction because the output now includes a tab that shows just the normal code, but the log is as confusing and unfriendly as ever so there is still room for improvement. Second, EG needs a DATA step builder because the DATA step (what power, what elegance!) really is the secret to SAS’s success. There is good news on this. The next release of EG (4.3) lacks a task to build DATA steps, but it does include promising features that will help new programmers to write SAS programs (including DATA steps). We may yet see EG transformed into a powerful learning tool for programmers. You can already do this, of course, with SAS/Connect, but it’s easier with EG. However, installing the software and setting up those servers is still not for the faint of heart. And you’ll need SAS Integration Technologies which, I understand, is pricey. Because not everyone wants to write ODS statements. If you already know how to write SAS code, but you have yet to master PROC SQL, then you are in luck. You really can learn to write SQL code by using the point-and-click Query Builder and then studying the code it generates. You’ll be spouting terms like left inner join, right outer join, and full join in no time. Personally, I’ve never considered PROC TABULATE that hard to use. But I will admit that you have to take it slowly, testing after you add each individual statement, option, or variable. But with EG it’s as easy as can be. Just point-and-click your way to the rectangular, summary report of your dreams complete with the colors, fonts, and formats of your choice. Because hardly anyone wants to write TEMPLATE procedures. See–at a glance–the logic behind your work, how it all fits together, how it builds to your final results. From the first edition, The Little SAS Book: A Primer has had quotes at the beginning of each chapter. It is a literary, whimsical touch, intended as much for irony as for inspiration. Benjamin Disraeli, speech Nov. 19,1870. So he may cease to write, and learn to think. Prior, To the Person Who Wrote Ill, On Same Person. Shakespeare, Troilus and Cressida. Act V. Sc. 3. L. 108. John Selden, Table Talk, Power. Benjamin Disraeli (Earl of Beaconsfield), Speech in House of Commons, Jan. 24, 1860. Shakespeare, Macbeth, Act 5, Sc. 3, L. 1. Emerson, Letters and Social Aims, Quotation and Originality. The greater part of our writers…have become so original, that no one cares to imitate them: and those who never quote in return are seldom quoted. Isaac Disraeli, Curiosities of Literature, Quotation. Swift, Verses. Occasioned by Whitehed’s Motto on his Coach. Lord Peter Wimsey in Have His Carcass by Dorothy Sayers, 1932.